Dutch midfielder Davy Propper says Albion will go to Bournemouth full of confidence on Friday. 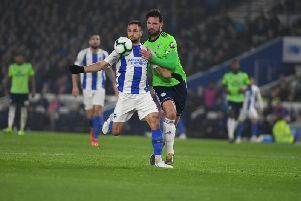 The Seagulls have picked up four points from their last two Premier League games - a 0-0 draw at Watford and 3-1 win against West Brom - and Propper feels the team is getting better all the time. Reflecting on Saturday's victory at home to the Baggies, Propper said: "It's so important to have confidence. The team is growing and we're playing better and better. "The three points is the most important but to score goals is also a good feeling for the team. If you stay on zero (goals), it's not good. "The confidence is much better, after the first win and also after Watford. We get the feeling we are a good team and we can get points." Propper scored twice for the Netherlands in their 3-1 win against Bulgaria last week and feels he is now settling into his role at Albion: "The first matches were not my best games but I think I've found my place now. "It takes some time, you need to know the players, the style they play, where I can find my space, and to play together with the team. "It takes a couple of weeks and I hope I am there now. I feel good and also about the team. We've made some progress."